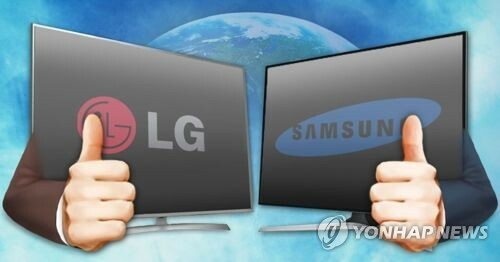 SEOUL, Nov. 15 (Yonhap) — Samsung Electronics Co. and LG Electronics Inc. plan to offer major discounts for their high-end televisions in the United States to mark Black Friday, the companies said Thursday. Samsung Electronics said it will offer large-scale discounts for 14 different models of 4K QLED smart TVs in the U.S., with the price tag on the 75-inch QLED Q6FN TV standing at US$2,000, down 43 percent from the original price of $3,500. The 82-inch model of the same product will boast a discount of 33 percent. The South Korean tech giant, however, did not offer a discount for the newly released 8K 85-inch QLED smart TV. LG Electronics’ U.S. office also vowed to provide big price cuts for some 10 different premium TVs. The 4K 55-inch OLED C8 TV, equipped with LG’s artificial intelligence platform AI ThinQ, is available for $1,700, down 32 percent from the original price. The 65-inch and 77-inch versions will be sold with more than 20 percent discounts for $2,700 and $7,000. The 55-inch LG Super Ultra HD TV SK9000 is available for $900, down 40 percent from the original price tag, the company said. Industry watchers, meanwhile, said that despite a rising number of South Koreans making purchases from U.S. online shopping malls, they need to consider costs involving shipping and customs, as well as the fact that they may face troubles in receiving assistance during installation.